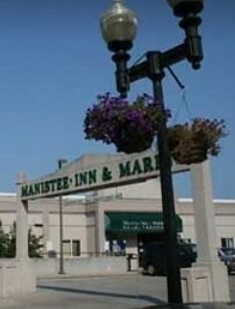 Surrounded by shops, bars and restaurants, this straightforward hotel along the Manistee River is a 5-minute walk from live shows at the Ramsdell Regional Center for the Arts and 2 miles from 5th Avenue Beach. Unassuming rooms offer TVs and free Wi-Fi; upgraded rooms add river views. Suites come with sofabeds, wet bars and coffeemakers, and some also have microwaves, minifridges and/or whirlpool tubs. Continental breakfast and parking are complimentary. There’s also a marina with 15 boat slips, and a fish-cleaning station, plus a coin-operated laundry.